The Sevilla players keep the ball and are exchanging a combination of passes. They are waiting for gaps in the defence to open up. Franco Vazquez (Sevilla) dinks a cross into the box in an attempt to find one of his teammates, but the defence manages to clear. Daniel Carrico (Sevilla) times his run too early and the linesman raises his flag for offside. A clever short pass gives Sergi Gomez (Sevilla) a clear goal scoring opportunity, but he fluffs his lines and rifles the ball high over the bar. Quincy Promes (Sevilla) works the corner short instead of sending the ball into the penalty area. Luis Muriel (Sevilla) serves up a nice cross, but the defence clears the danger. The referee signals a corner kick to Sevilla. Roque Mesa (Sevilla) finds himself with a great opportunity! He unleashes a shot from the edge of the box, which whizzes just wide of the right post! The Sevilla players are exchanging some short passes. The referee stops play so that a substitution can be made and Andre Silva leaves the pitch and Luis Muriel (Sevilla) comes on. We are about to witness a subsitution. Roman Shishkin (Krasnodar) for Maciel Wanderson. Sevilla control the tempo of the game by exchanging some accurate short passes. Sergio Escudero (Sevilla) trips an opposition player and Daniel Stefanski signals a foul. Here is a change. Wissam Ben Yedder is going off and Pablo Machin gives the last tactical orders to Jesus Navas (Sevilla). 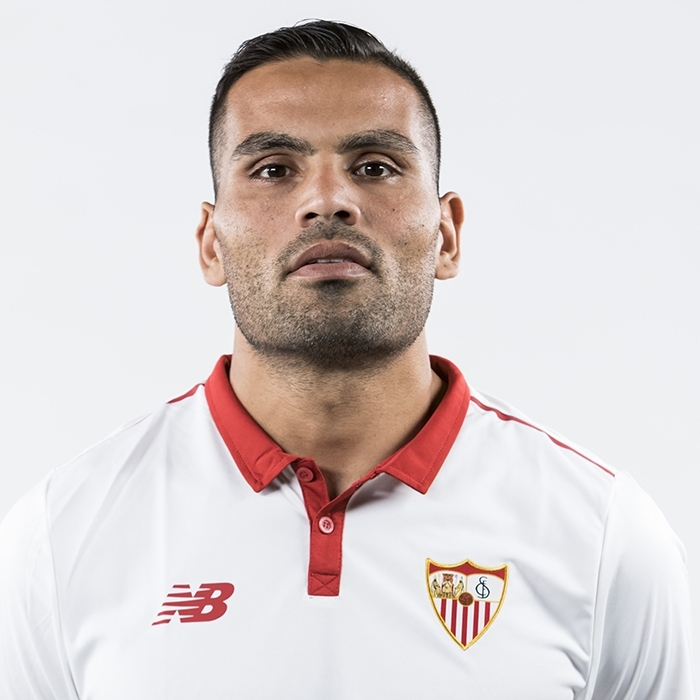 The referee signals that it is time for a substitution and Ibrahim Amadou (Sevilla) comes onto the pitch so that Ever Banega can be given a rest. Quincy Promes (Sevilla) crosses the ball into the box, but one of the defending players averts the threat. The total shots for both teams statistics – 12:8. The foul by Ever Banega (Sevilla) is worthy of a card and a yellow is duly shown by Daniel Stefanski. Christian Cueva (Krasnodar) gets on the ball and beats an opponent, but his run is stopped by the referee Daniel Stefanski who sees an offensive foul. Substitution. Viktor Claesson did his best and is replaced by Christian Cueva (Krasnodar). A quickly taken corner by Sevilla. Wissam Ben Yedder (Sevilla) is caught offside! Wissam Ben Yedder (Sevilla) attempts to convert a cross into a goal, but his promising header from near the penalty spot towards the left post is denied by a decent save from Stanislav Kritsyuk. The linesman signals that Maciel Wanderson (Krasnodar) is offside and the referee confirms the decision. Charles Kabore (Krasnodar) takes a mid-range shot, but it lacks accuracy and it goes way over the bar. It's time for a substitution. That's the last involvement from Mauricio Pereyra as he is replaced by Dmitry Stotsky (Krasnodar). Goal! Stanislav Kritsyuk gets a hand on the penalty from Ever Banega (Sevilla), but can't stop it from flying into the bottom left corner. The referee shows a red card to Cristian Ramirez (Krasnodar). The players claim that Mauricio Pereyra (Krasnodar) handled the ball inside the box and it seems they are right. Penalty! A huge opportunity to score for Sevilla. Daniel Stefanski blows his whistle and the second half starts. The resulting set piece from Krasnodar is comfortably intercepted by one of the defending players. A cross from a mid-range free kick, taken by Krasnodar, is intercepted by one of the defenders. Krasnodar force their opponents to concede a corner. Cristian Ramirez (Krasnodar) gets a yellow card. Quincy Promes (Sevilla) will have to be careful for the rest of the match as he is shown a yellow card. Viktor Claesson (Krasnodar) fires the ball towards the right side of the goal from close-range, but his shot is blocked by one of the defenders. Krasnodar take the corner, but their hopes of scoring a goal end with nice clearance by the defence. The defence is alert as they clear a dangerous cross from Yury Gazinskiy (Krasnodar). Krasnodar force a corner. Their opponents will face another attacking threat. Ever Banega (Sevilla) fails to find any of his teammates inside the box as his pass is blocked. Sevilla win a corner. Dangerous play by Andre Silva (Sevilla). Daniel Stefanski blows his whistle for a foul. Cristian Ramirez (Krasnodar) gets into a good scoring position. He creates some space for himself and tries his luck from distance. His decent effort towards the bottom left corner is, however, superbly saved by Tomas Vaclik! Ever Banega (Sevilla) takes the corner but fails to find any of his teammates. Wissam Ben Yedder (Sevilla) races towards goal but the defender gets back well to make a challenge. The ball is out of play. Sevilla will have a chance to score from a corner. Mauricio Pereyra (Krasnodar) commits a foul on his opponent and it looks like it should be the other way around at first glance, but the referee makes the right decision in awarding a free kick to the other team. Mauricio Pereyra (Krasnodar) slides a pass forward, but one of the defenders cuts it out. Sevilla quickly take the free kick with a short pass. Charles Kabore (Krasnodar) should know this behaviour is beyond the rules. He was too careless with his challenge and left Daniel Stefanski no option but to blow his whistle. 6:3 – this is the total number of shots produced by both teams. Cristian Ramirez (Krasnodar) sprays a pass out to Maciel Wanderson, but he can't beat his man inside the box. Sergio Escudero (Sevilla) drives a shot towards the left side of the goal from inside the box, but Stanislav Kritsyuk leaps like a salmon and knocks the ball away. Booking. Yury Gazinskiy (Krasnodar) receives a caution from the referee. Wissam Ben Yedder (Sevilla) receives a great chance inside the box and finds the back of the net with a low drive that goes into the middle of the net. Ivan Ignatjev (Krasnodar) finds space inside the box but rifles his effort just wide of the left post. Goal! A mistake from the defence gifted a chance to a lurking Wissam Ben Yedder (Sevilla), who keeps his cool and rolls the ball into the net from close range. 1:0. Ever Banega (Sevilla) puts a cross into the box from the corner but there is no panic from the opposition and they easily clear. The corner is floated into the centre of the box, but a placed header from Wissam Ben Yedder (Sevilla) flies well wide of the right post. It will be a corner kick for Sevilla. Sergio Escudero (Sevilla) shoots from outside the box, but his effort is blocked. Daniel Stefanski will officiate today.